Barracouta are caught in coastal waters around mainland New Zealand, The Snares and Chatham Islands, down to about 400 m.
Over 99% of the recorded catch is taken by trawlers. Major target fisheries have been developed on spring spawning aggregations (Chatham Islands, Stewart Island, west coast South Island and northern and central east coast South Island) as well as on summer feeding aggregations, particularly around The Snares and on the east coast of the South Island. 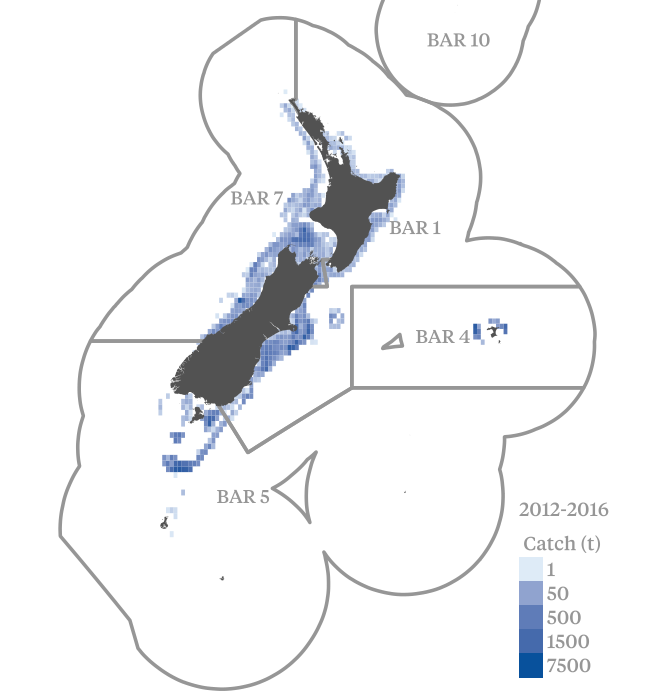 Barracouta also comprise a significant proportion of the bycatch in the west coast North Island jack mackerel fishery, The Snares squid fishery, and the east coast South Island red cod and tarakihi fisheries. Barracouta are commonly encountered by recreational fishers in New Zealand, more frequently in the southern half of BAR 7 and BAR 1. Barracouta are typically harvested as bait for other fishing rather than for consumption. Barracouta are managed by the Ministry for Primary Industries under the Quota Management System (QMS). The risk assessment covers over 90% of barracouta caught in New Zealand. There are thought to be at least four main stocks of barracouta, based on known spawning locations and movements and stock boundaries are not well understood. There are no integrated stock assessments available for any barracouta stocks. The most recent stock assessment of BAR1 was undertaken in 2016 and the Ministry for Primary industries concluded that the stock is very likely (>90%) to be at or above the target reference point. The most recent stock assessments of BAR5 and BAR7 were undertaken in 2017 and 2016 respectively. The Ministry concluded that both stocks are very unlikely (< 10%) to be below both the soft and hard limits. However, the status in relation to the target reference point is unknown, meaning there is less evidence that the stocks are fluctuating around a level consistent with maximum sustainable yield (MSY). Although there is limited evidence that the harvest strategy for barracouta is responsive to the state of the stock from catch adjustments over time, the position of the stock against proxy reference points is regularly monitored using fishery catch per uniteffort and independent trawl surveys. Information on the discarded portion of the catch is limited. Observer coverage in inshore fisheries has historically been very low (or absent from some sectors), and the main information on overall catch composition comes from independent trawl surveys, which may not be an accurate reflection of commercial catch composition (for example different gear may be used). There is also limited reporting of discards in commercial catch returns. Given the absence of discard information for all sectors, it is not possible to assess impacts and the fishery is assessed as precautionary high risk. The introduction of electronic monitoring in some sectors may help to better characterise discards. Target species - Stable: All stocks appear to be well above the point of recruitment impairment. BAR5 and BAR7 may improve scoring is additional evidence is presented that stocks are fluctuating at or around levels consistent with maximum sustainable yield.